Cheryl B. Engelhardt, an independent musician and composer who’s killing it with all things indie, happens to be a huge dork with email and will give you a great marketing upgrade. (It’s okay, she calls herself a dork.) She is so good at it that with just a small list (under 2k fans) she was able to raise $20,000+… twice… for her two most recent records, perform dozens of house concerts, and even received airline miles that her fans weren’t using so she could fly her band to a Swiss festival. Not only is Cheryl the guest for the November CYBER PR LAB – Level Up Your E-mail Game, she and Ariel are doing a free live training to give you the marketing upgrade that you need. 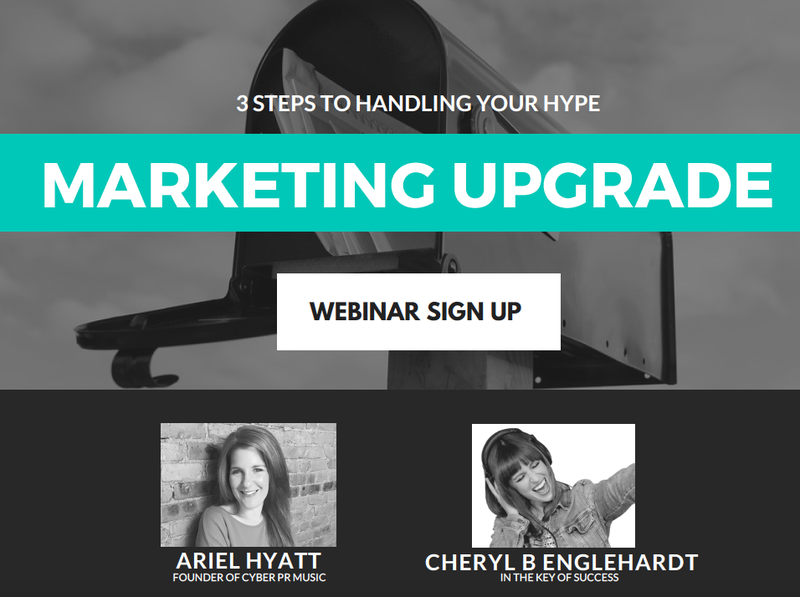 It’s called Handle Your Hype (3 steps to a marketing upgrade). We’ll cover the key things you can do right now to make your social media, streaming sites, and email list work for you, not against you. There will be a replay if you can’t make it. But if you CAN, stick around to the end where you’ll be part of our live Q&A!